When students express interest in private equity, they often envision working for large firms that manage billions of dollars in assets, like KKR or Blackstone. However, new and innovative paths into private equity are emerging, as some firms are turning away from the big companies, focusing instead on managing smaller assets and building trusting, long-term relationships with such businesses. 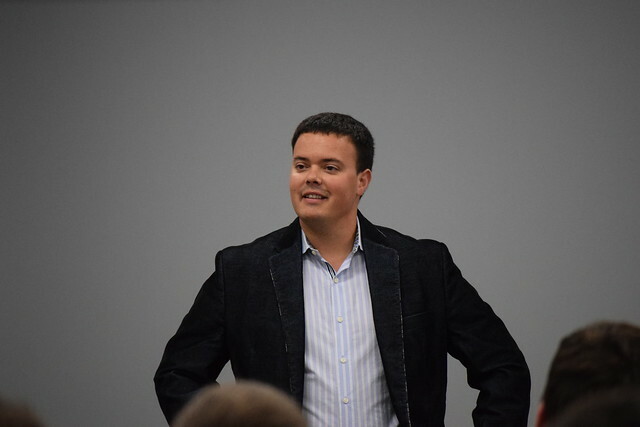 In order to expose students to these diverse and nontraditional careers in private equity, the Notre Dame Institute for Global Investing (NDIGI) invited adventur.es Founder/CEO Brent Beshore to speak to students. These students were enrolled in the Applied Private Equity Projects course (APEP) as well as the Investment Management Leaders during the 2017 fall semester. Beshore is a graduate of Washington and Lee University, where he studied politics with an emphasis in poverty studies before attending the JD/MBA program at the University of Missouri. In 2007, Beshore founded adventur.es, despite not having any background in traditional private equity management. Adventur.es is a private equity firm that invests in North American businesses. The company brands itself as “a family of companies investing in family-owned companies” that partners with businesses “looking toward retirement and/or expansion.” The owner earnings of these businesses currently generate $2 million to $14 million a year. In the annual adventur.es letter, Beshore remarked how he believes that “the market for private U.S.-based businesses valued under $50M presents the greatest (legal) investment opportunity currently available.” Many of these businesses are family-owned and are the life’s work of their owners, but they present risky investments from a traditional private equity perspective. Beshore and the small team at adventur.es capitalize on chances to expand their portfolio while also establishing trusting relationships with these often overlooked companies, and this approach has proved fruitful as adventur.es recently raised $50M of outside capital. Adventur.es seeks talented people looking to do meaningful work in a team-based environment, and two Notre Dame seniors connected with this mission this year. In July, upcoming graduates Greg Trinkl and Steve Nash will join the adventur.es team as Business Associates. Trinkl and Nash reached out to Beshore after being introduced to him and his unique permanent equity strategy through the APEP class. Trinkl echoed this sentiment and also expressed enthusiasm for the distinct experiences for growth that adventur.es offers. “By taking a non-traditional pathway, Steve and I have the potential to become operational CEOs at a young age and gain invaluable experience in the process,” he said. One of the cornerstones of NDIGI is exposing students to industry practitioners with the intention of keeping these students aware of the different paths in the finance and investment management industry and allowing them to network with these professionals and learn from their experiences. NDIGI’s managing director Kevin Burke designed and taught the APEP course for the fall of 2017. “Applied Private Equity Projects is designed to provide an environment for students to learn from practitioners and gain real-world experience in private equity. Through guest lecturers like Brent, we are exposing our students to a wide variety of careers in finance,” Burke said. As a direct result of providing opportunities to experience to meet and learn from professionals like Beshore, students were able to discern future career choices and navigate the world of the investment management industry to find a fitting destination.